This view of Lake Silvaplana was taken just a few degrees to the left of that which I showed the other day. It was also taken in late morning while the other was captured at sunset. It was difficult to determine, using Google maps, but my best guess is that the peak might be Piz Corvatsch (3,451m). We visited the lake as part of a day trip to St. Moritz which can only be described as having been bittersweet. 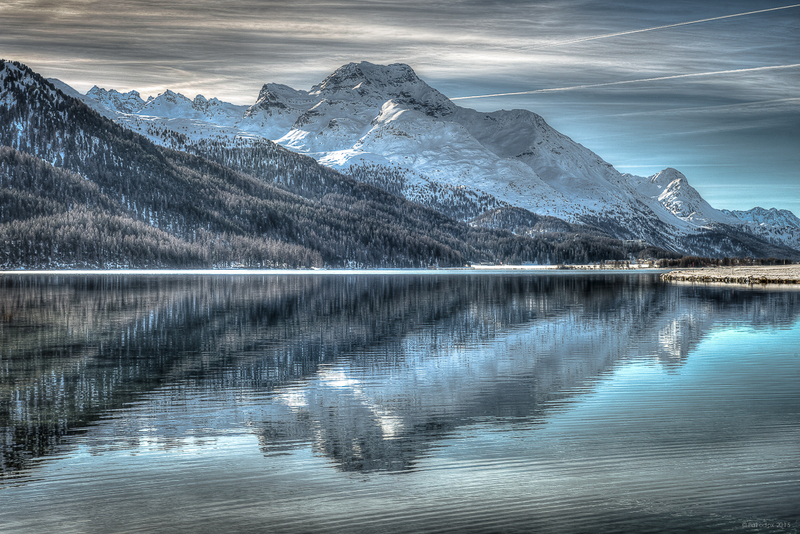 The city has some very beautiful, and very old, churches and we were delighted to have seen the St. Moritz-Celerina Olympic Bobrun which is the oldest bobsleigh track in the world and the only one that is naturally maintained (it doesn’t require refrigeration). The city held few other attractions for us, save some very excellent (and not too sweet) hot chocolate. The single thing of value that I brought home with me from that playground for the international jet set was an affirmation of what, after all of the fluff and nonsense is driven off, is important.